This article was originally published by the Danish Institute for International Studies (DIIS) on 6 September 2018. The security environment of the EU is being subjected to unprecedented challenges by new kinds of threat that require new kinds of responses. Migration pressures, hybrid threats, transnational crime and terrorism can only be managed by adopting a comprehensive approach that combines civilian, military, economic and political aspects. The EU should develop its civilian CSDP further to address a security environment that is changing because of migration, hybrid threats, organized crime and terrorism. The links between internal and external security should be strengthened, partly by improving cooperation between EU institutions. Partnerships with third parties like NATO and the UN must be improved both at the headquarters level and on site. EU member states must strengthen their engagement in civilian CSDP and refrain from micro-managing mission implementation. The EU’s Common Security and Defence Policy (CSDP) has taken some major leaps forward since the EU published its latest Global Strategy in June 2016. Based on this strategy, a plethora of new initiatives to bolster the military dimensions of the EU have been initiated, including the launch of Permanent Structured Cooperation on Defence (PESCO) and the new European Defence Fund (EDF). Although it has received less attention, the Global Strategy has also bolstered the civilian aspects of the CSDP, which remains a fundamental part of the EU’s role as an international security actor. A so-called Civilian CSDP Compact has been drawn up with the aim of reinvigorating civilian CSDP and is expected to be adopted finally in autumn 2018. Through it, the EU Council aims to revise the so-called Feira Priorities and adapt them to the current security context of today. These priorities have governed the purpose of civilian CSDP since 2003 to be focused mainly on the police, rule of law and civil administration in third countries. The Civilian Compact will constitute the political framework for the EU’s future civilian CSDP activities, in line with the EU’s new Global Strategy (GS) to strengthen the EU’s role as a security actor. The challenge remains to transform these good intentions into real actions that can help invigorate civilian CSDP as a modern, flexible foreign-policy instrument, which in turn will strengthen the EU as an effective and legitimate security provider. 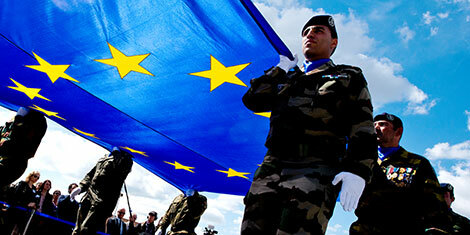 The CSDP has traditionally been an instrument of the EU’s external policy focused on promoting peace and other European core values outside the EU’s borders. Today, however, the security role of the EU and its CSDP is being re-framed to focus on addressing the EU’s internal security concerns. As one of the key priorities in the EUGS states, ‘the EU must be able to protect the Union and its citizens’. Recent CSDP crisis management missions, such as EUNAVFOR MED in the Mediterranean, EUBAM in Libya and EUCAP Sahel in Mali, also share characteristics of this trend. Arguably, today’s complex security challenges, where it is increasingly difficult to separate distant external challenges outside the European continent from their consequences within Europe, is making it increasingly necessary to frame these challenges, and the responses to them, as simultaneously internal and external. Moreover, in times of the existential internal crisis in the EU aggravated by Brexit, it is also crucial for EU institutions and European leaders to be able to highlight the continued relevance of the EU project. In this respect, utilizing and strengthening civilian CSDP offers a welcomed opportunity to address the challenges at the interface between external and internal security by means of capacity-building in third countries, but also increasingly in the areas of border management, combating organized crime, counter­-terrorism and migration. While civilian CSDP instruments have been used for similar tasks outside the European continent, they have never been used to address security concerns within the EU itself. Civilian CSDP may therefore prove to be an adaptable tool with which to address new kinds of internal security concerns. Strengthening the interface between internal and external security requires increased cooperation between various EU actors across different institutions. The different kinds of EU actors that work on both internal and external security, including the European External Action Service (EEAS), with its CSDP structures, the EU Commission, and freedom, security and justice (FSJ) agencies such as Frontex and Europol, are very different actors with distinct decision-making processes, resources and roles given to them by the EU’s member states. Until now little inter-institutional cooperation has been established, the different actors instead tending to protect their own patches of turf, whether in Brussels or on site. Even though the Lisbon Treaty aimed to increase coherence across institutions, this has not been fully realized in respect of either policy or implementation. It will therefore take time and careful effort to enable the various EU actors to create common methods of working to ensure closer coordination between the internal and external dimensions of the EU’s security policies. This could be done by means of joint policy-planning meetings both in the mission-planning phase and at implementation. Concrete cooperation between joint missions could also be envisaged, though systematic cooperation between the different security actors should not necessarily be a goal in itself. The different EU actors often come with different approaches, and it will sometimes be cumbersome and require unnecessary resources to have them work together at all costs. In either case, it is pivotal that the EU and individual member states take measures to avoid competition between resources, as each member state ultimately draws on a single pool of civilian capacities. The idea of a Civilian Compact with the aim of reinvigorating civilian Common Security and Defence Policy (CSDP) is put forward by a group of member states (including Denmark and Germany). The Council adopts conclusions on strengthening CSDP. A Civilian Capability Development Plan identifies the challenges ahead and the key capabilities that civilian CSDP must deliver. The final civilian CSDP Compact is expected to be adopted, following a process in which member states agree to commit resources based on the capability gaps identified in the civilian capability development plan. The EU’s comprehensive approach rests not only on strengthened internal coordination and cooperation between different EU actors and their instruments, but also on increased cooperation with external partners. Since the inception of the CSDP, the EU has been working closely with external organizations such as the UN and NATO, and increasingly also the African Union and OSCE. The EU should continue to institutionalize further its working relations with its core international partners. Inter-organizational cooperation is becoming increasingly relevant in today’s complex conflict environment, in which no institution or state can afford to concentrate on its own activities alone. How actors coordinate their work in the field in order to avoid competition between them is therefore crucial. While the plurality of actors on the ground risks duplication of effort, it is also an opportunity for all the actors involved to benefit from a collectively coordinated response. Ideally, there should be active channels of coordination and cooperation between the EU and key partners at all policy levels. In the policy-planning phase, a clear division of labour should be established to offer added and complementary value at the subsequent implementation phase. Here, key actors in the EEAS involved in the policy-planning phase, including the Civilian Planning and Conduct Capability (CPCC) and the Crisis Management and Planning Directorate (CMPD), will need to work more effectively and consistently together with key actors in the policy-planning phase. There exist various examples where ad-hoc, practical cooperation works very well on the ground, but may be aborted or not fully realized because of less developed institutional coordination at the HQ level. The joint EU–NATO declarations of 2016 and 2018, as well as enhanced cooperation with the UN as further developed through several strategies, such as the ‘Actions to Enhance EU CSDP Support to UN Peacekeeping’ of 2011, are important channels that should be used to strengthen coordination at all phases of the policy process. Success in strengthening civilian CSDP and adjusting it to new kinds of security tasks will largely come to rely on the extent to which member states will actively support this process. The civilian dimension of the CSDP has traditionally been limited in scale, being less visible and less prioritized by EU member states as compared to the military counterpart. The current process of adopting the Civilian Compact is therefore an important first step in reinvigorating it. To provide incentives for the member states’ sending authorities, and to ensure more politically visible engagement by member states, participation in civilian CSDP missions must be made more attractive. This could involve, for example, promoting CSDP as a career path and providing other incentives that would ensure that civilian CSDP has a place in national priority-setting when experts are seconded to the EU. There is also a need for member states to move away from micro-managing mission implementation, as has often been the case, and instead to delegate more responsibilities to the Heads of Mission, since mission implementation requires a certain level of EU autonomy for it to run smoothly and be effective. The current establishment of civilian CSDP personnel is about two thousand deployed on ten civilian CSDP missions in Europe, Africa and the Middle East, this representing a decrease from earlier years. If the EU and its member states can learn to view civilian CSDP missions as a new, scalable instrument, member states must actively use it as such, and provide it with the necessary funds and resources. Only then can the civilian CSDP instrument live up to its potential by serving the security interests of the EU and its member states in today’s complex and ever-changing security environment. This policy brief is based on inputs acquired at the conference ‘The EU as a Civilian Superpower: Which Contributions to European Security?’ which took place on 4 June 2018 in Copenhagen, co-hosted by the European Union Institute for Security Studies (EUISS), the Danish Foreign Ministry of Foreign Affairs and DIIS. Christine Nissen is a research assistant of foreign policy at the Danish Institute for International Studies. Her main area of research is EU foreign and security policy, including the workings of the European External Action Service, the High Representative, and other EU institutions working on foreign policy issues.